You know what I find funny? Not funny ha-ha...funny ironic. It's the fact that although I always like the book better than the movie, I tend to like the movie better if I've watched it before I've read the book. I guess that comes from the fact that if I've read the book and developed the characters in my mind and had a good laugh or a good cry, I've already attached myself to the story the way I imagined it. I find myself completely and totally irrational about the way a screenwriter or filmmaker changed something or cast the wrong (in my mind) actor/actress. HOWEVER, if I watch the movie adaptation first and really enjoy it...laugh with it...cry with it...and then I go back and read the book for the first time, I'm able to look at it objectively and see where the screenwriter was coming from. Maybe I won't fully agree with the adaptations or the casting choices, but for some odd reason, I'm able to go-with-it...to accept it. I'll pretty always still like the book better, but I won't hate the movie in that case. I'm a strange one, I suppose. Or are there other people who feel the same? So often times, if I haven't yet read a book and I see a movie based on a book coming to theaters, I'll wait to read the book until after I've gone to see the movie. I know myself. I'm saving myself from inevitable disappointment. I can only think of one exception to the (my) rule (that the book is ALWAYS better than the movie), and that would be The Notebook. I thought the movie blew the book away. Maybe it's just Ryan Gosling. Maybe it was the undeniable chemistry between Gosling and McAdams. I don't know. It just "is". But I digress. 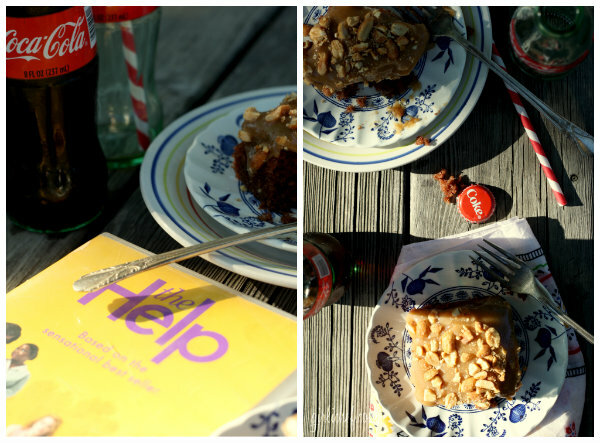 What I really wanted to say was thank goodness I watched the film adaptation of The Help before I read the book. Because I think the movie is fantastic! I thought it was brilliantly cast, though Skeeter seemed a little different in my head after I read the book, it still wasn't a disappointment. I loathed Hilly and wanted to punch her in the face in both the film AND the book, so that's the sign of a good film adaptation to me...that I can love and loathe the same characters (more about my favorite character in a minute...). Now, in case you haven't seen the film (or read the book), I don't want to give too much away. But I will say that it is set in Jackson, Mississippi in the early 1960's. It is about racial tension, segregation, ignorance, pain, and the problems faced in the South, especially Jackson Mississippi at the time. But it is also about civil rights, friendship, hope, and change. I laughed, I fumed, I cheered, and I cried. And not just the first time I saw the film. Also when I read the book afterwards. And again when I watched the film for the second time. It's a story of human rights, human pride, and human emotion...I don't see how it couldn't pull (twist, turn, and strum) your heart-strings. On to my favorite character in the film and the book. That would be Celia Foote. Her skin may be white, but she is treated just as badly by the other girls in Jackson as 'the help' is because they consider her white trash. Mostly because she's beautiful and kind and married the "leader" of the group's ex-boyfriend, Johnny. So, it's jealousy, of course. But I thought that Celia was a bright spot in the story and that Jessica Chastain brought her to life perfectly. Celia: "One of those upside down cakes from a magazine. It ain't workin' out too good. Come on, let's getcha a cold coca-cola." ...Celia and Minnie are drinking Coke from bottles and walking around the house and the yard. Minnie has no clue what to think of the bubbly Celia, but she follows along and listens to all she's jabbering about. And that is the start of their relationship. And some great scenes in a beautiful kitchen with gorgeous light streaming in. I'm a Coca-Cola girl. Always have been. So that combined with this fabulous scene in the movie (which if you haven't seen it, I did absolutely NO justice to in that lame explanation) inspired me to head into the kitchen to make a cake I think of as Southern. 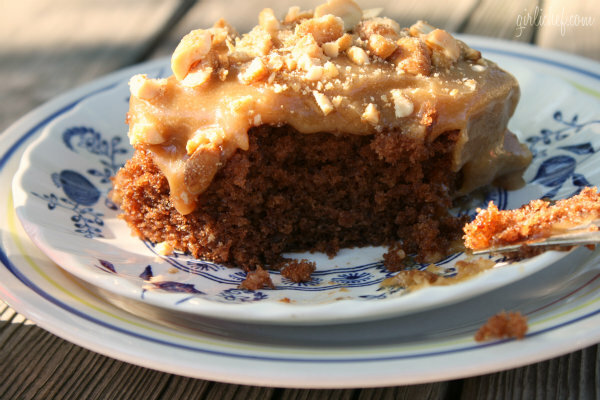 Chocolate cake infused with coca-cola and topped with a thick layer of peanut butter frosting is a Southern classic. 1/2 cup buttermilk, at room temp. Preheat oven to 350° F. Grease a 9"x13" pan. Stir cola and buttermilk together in a large measuring cup. Cream butter and sugar together until light and fluffy. Beat in eggs and vanilla bean paste at low speed, until just combined. Combine flour, cocoa, baking soda, and salt in a bowl. Add to the butter mixture, alternating with the liquid (cola + buttermilk), starting and ending with the dry mixture. Beat on low until just combined. Pour into prepared pan. Slide into preheated oven and bake for 30-35 minutes or until a toothpick inserted in the center comes out clean. Cool in the pan set on a wire rack for 10 minutes. While the cake starts to cool, melt the butter in a large saucepan over medium heat. Whisk in milk and bring to a boil, whisking constantly. 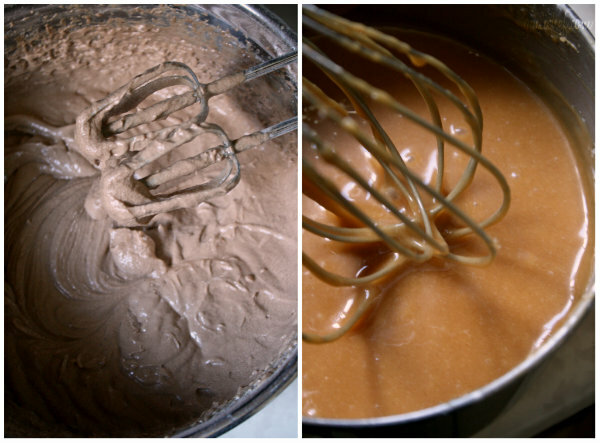 Reduce heat to low and whisk in peanut butter until smooth. Gradually whisk in powdered sugar until smooth. Be patient and whisk until all of the lumps disappear. Remove from heat and whisk in vanilla. Immediately pour the frosting over the cake that has cooled for ~10 minutes. Sprinkle with chopped honey-roasted peanuts. Serve warm, at room temperature, or refrigerated. Enjoy! 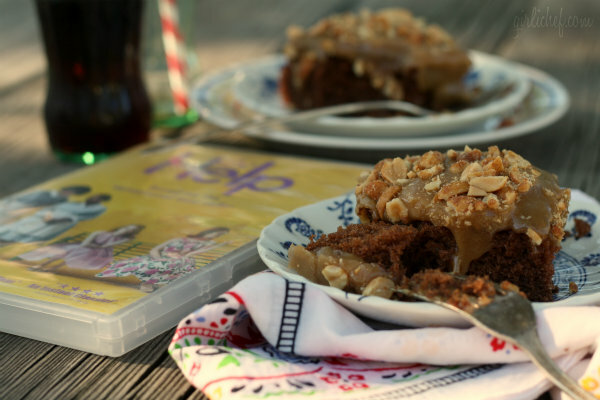 This month's Food 'n Flix pick is The Help, chosen by our host for the month, Glennis from Can't Believe We Ate. 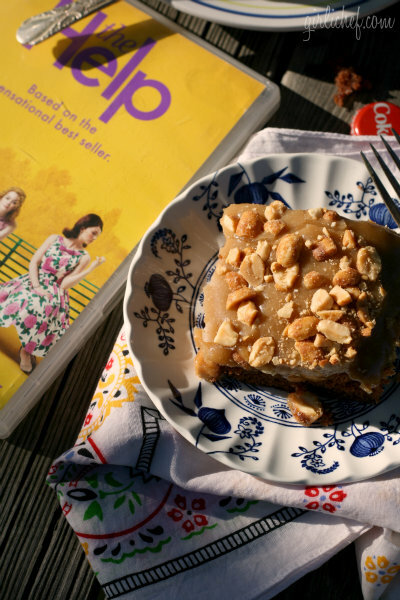 There's still time to watch the flick and cook or bake up something inspired by it. Head on over to the announcement post for more details! 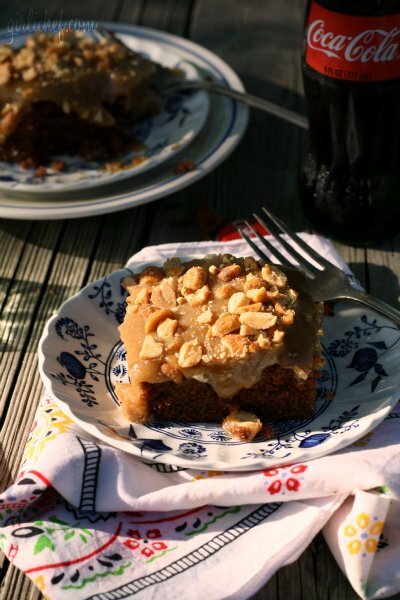 I just stumbled across this wonderful essay entitled Coke and Peanuts at Leite's Culinaria. Fantastic food memory post...and it supports the whole Coke & Peanuts in the South thing I have going on here.